The records are surprisingly complete as to the causes of death. How they died during the boomtown era gives a pretty good idea of how they lived. Clearly, violent death was commonplace. 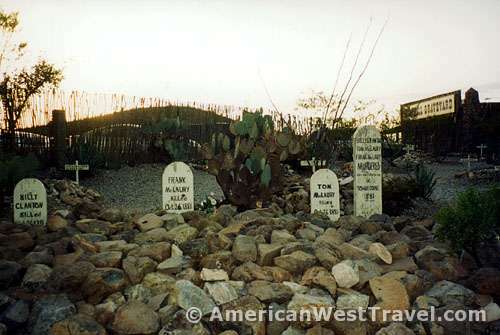 At right, two of the numerous "unknown" graves at Boothill. Most of these were due to the original markers rotting away, and not being able to determine who was lying there. 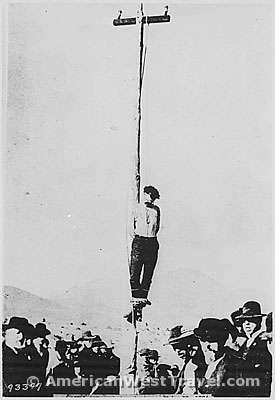 Surprisingly, only eleven deaths were attributed to hanging. In this lawless era, justice was not exactly applied evenly or even regularly. People were shooting each other left and right apparently without any punishment while a man who innocently purchased a stolen horse (see grave marker of George Johnson below) climbed the scaffold. Legal justice was swift for the rest of Heath's gang. 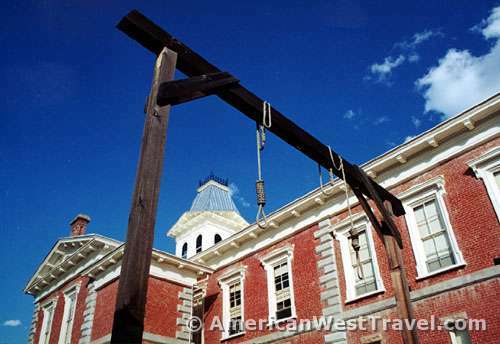 The five men were hanged simultaneously on March 8, 1884, in the court yard of the Tombstone Court House. Capital punishment was a function of county government until Arizona became a state in 1912. The court yard scaffold at right is a replica of the 1912 version when the county hangings came to an end. Obviously a much larger structure was erected for the five men. 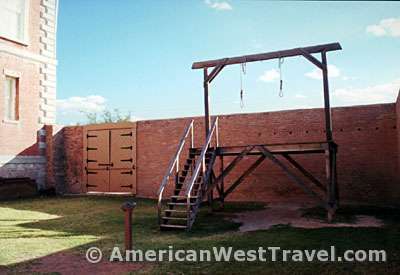 The mass execution was a matter of public record which also included lurid details such as how the men died (one broken neck, the rest strangled) and how long it took (up to 10 minutes). 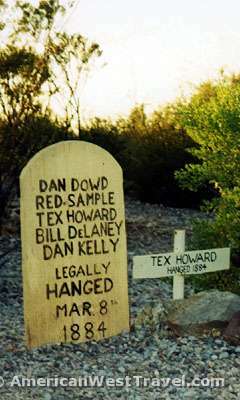 A number of graves had humorous or ironic epitaths. Many used the departed's colorful nicknames. I have been told that all grave markings are exact duplicates of the originals where they were known. A sampling appears below. The most celebrated residents of Boothill were of course the losers of the Gunfight at the O.K. Corral, Billy Clanton and the McLaury brothers. 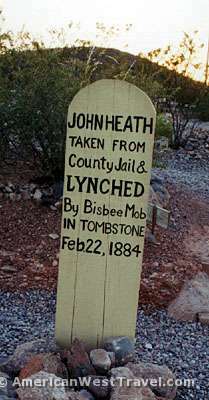 The common grave marker (photo left), prepared by their supporters, reads "Murdered on the Streets of Tombstone, 1881". 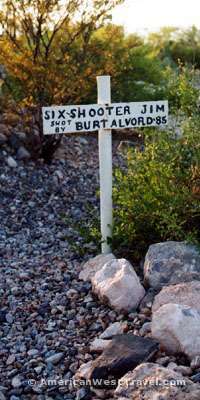 "Old Man" Clanton, Billy's father, was ambushed by Mexican bandits in August, 1881, and resides just to the left of his son. Morgan Earp, though he died in 1882, was not buried here. His remains were sent to his parents in Colton, California for burial. 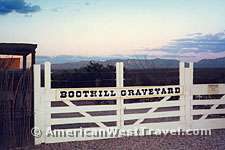 Virgil was interred in Oregon, Wyatt, in California, and Doc Holliday, in Colorado. 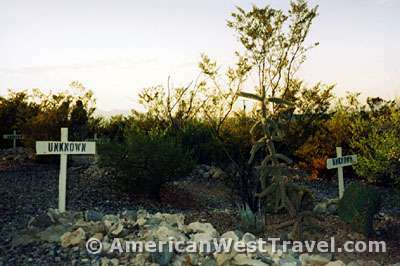 In the pioneer days, Tombstone was the county seat for Cochise County. 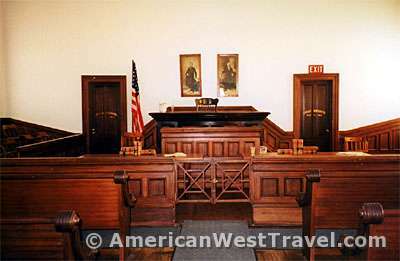 The Tombstone Court House was constructed in 1882 and was in service for almost fifty years. 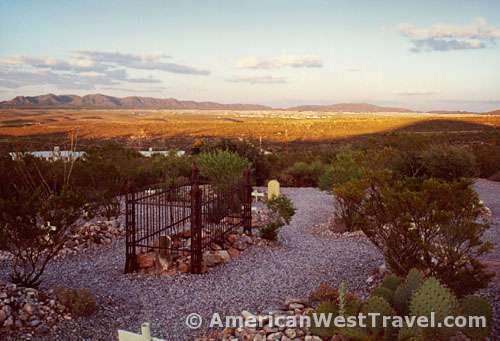 As the Tombstone mining boom faded, the growing town of Bisbee became the county's center of activity. In 1931, voters opted to move the county seat to Bisbee. After years of deterioration, the court house was restored to its original condition and became a state historic park. Along with artifacts of the court building, it also displays many other relics from early Tombstone. One room contains two studies by forensic scientists of the famous gunfight and their opinions as to the true sequence of events at the O.K. Corral. The photo, (left), shows the court room restored to what it was thought to look like in 1904. 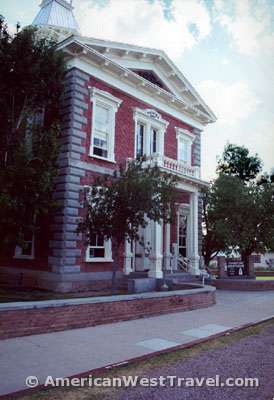 The photo, (right), is the front of the court house on Allen Street, Tombstone's main street.